A quiet but spontaneous English teacher by trade, Laurie never thought of herself as a creative. She has learned, however, that when she steps out of her comfort zone, she discovers skills she didn’t even know existed in herself. She became confident in her abilities through first sharing her art with strangers. As she puts it, a rising tide lifts all boats; because of the generosity of those around her, she has learned to stop confining herself to the perceptions she creates. To her, art is about courage and pushing past these fears. In her paintings, she uses a lot of color, and as much as she tries to tone it down, pink always seems to wind up somewhere in her work. The former English teacher and editor says, “The painting process for me is a bit like writing: first comes a disjointed rush of ideas; then structure emerges from subtracting, organizing, refining, and creating cohesion. However, on the canvas, unlike the printed page, I love for those stages to be visible: here, order doesn’t replace the chaos, it merely surrounds and shapes it.” This chaos in her art represents something real and she wants her pieces to show how thankful she is for her struggles, as she believes a big part of life is about persevering through the hard times. In life, just as in art, she loves through the difficulties. Whether it be with a person or a canvas, she keeps loving and hoping through all things. 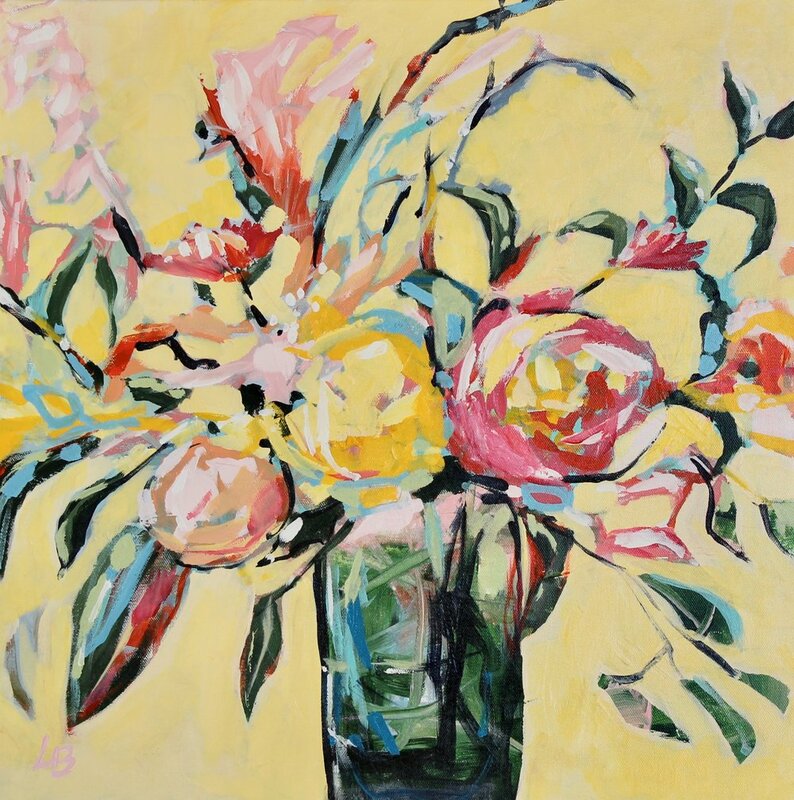 Most of her paintings deal with flowers and plants because as a child, Laurie loved spending the summers at her grandparents’ house in the countryside of northern Florida. Her grandmother grew all kinds of flowers, fruits and vegetables, and in spite of watching and admiring her work, she herself as a hard time keeping plants alive. A driving factor in why she enjoys painting them. She loves the variety of color, shapes, direction, and movement of plants. She prefers the abstract because even though you can see the lines, you are still able to see the plant. Laurie paints from her home in Greer, South Carolina amidst the wild ride that comes from mothering her three wonderful and active children and one gentle goldendoodle.